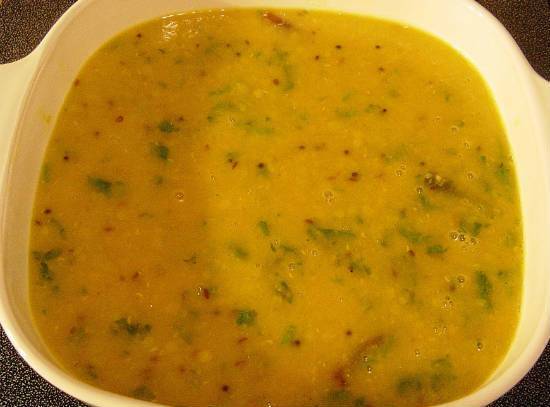 A delicious and healthy soup made with Masoor Dal. 2. Saute the onions, tomatoes and garlic for 2 to 3 minutes. 3. Add the masoor dal and stir-fry for a minute. 4. Transfer to a pressure cooker and add enough water. 5. Pressure cook until 3 whistles and remove. 6. When the pressure has reduced, remove the lid and mash the dal mixture well. 7. Pour the vegetable stock, garam masala powder, cumin powder, turmeric powder, red chilli powder, salt and pepper powder. 8. Simmer over medium flame for a few minutes. 9. Add the lemon juice and stir well. Feel free to comment or share your thoughts on this Masoor Dal Soup Recipe from Awesome Cuisine.